From Manila, it was a short flight to Bangkok. We had booked a small boutique hotel (called Casa Nithra) on Thanon Samsen, up the road from the hedonistic ‘Soi Ram Buttri’ road and the cheap shopping and Indian tailors on ‘Khaosan’ Road. A walk up and down these roads will get you to pass by dozens of good massage places, where you can be massaged while sitting in an outdoor lounger and engaging in people watching. Or perhaps you might prefer to be massaged indoors, in an air conditioned room, where they will give you loose pajama-like clothing to change into, wash your feet, lay you on a mattress on the floor, pull the curtains around you, and proceed to pull your limbs and crack your bones until you move beyond the threshold of pain, into a wonderful feeling. After only two Thai massages (220 Thai Bahts each, or about $7), my aching leg muscles from the previous week’s hiking in the rice terraces of Banaue were completely healed. These long streets are also lined with many overloaded shops selling the kinds of clothing that are loved by backpackers, like elephant-pattern, decorated loose pants, and Indian-pattern, hippyish shirts. None of the locals wear these kinds of clothing; the women are much more style oriented, wearing what looks like business attire. Business clothes do not fit the hot summer, but I rarely have seen any of the locals sweat. Their beautiful hairless skins process the heat very well. The area is also filled with street foods. We saw a lady carrying a pole with two large baskets on each end. She squatted down on the sidewalk and prepared a delicious papaya salad and a Thai noodle salad for a friendly man who kept on urging us to try it. She pounded the fresh chili peppers in a mortar and pestle, and added a fresh lime, a touch of fish sauce, some peanuts, some sugar, tore in some fresh herbs, and offered the man a taste of the flavor, so she can adjust the seasoning to his taste. She then took a green mango and green papaya, and with a large knife that looked like a machete, she skillfully peeled the fruit, and still holding it in the air, sliced it into thin matchstick slices for the salad. I love it that I can get fresh squeezed juices everywhere on the streets. I drink pomegranate juices, passion fruit juices, orange juices, mango and pineapple juices daily. Fresh fruit is sold everywhere, already peeled and ready to eat. There is a collection of sweets that taste delicious, and even though I passed many of them without buying, I know that I will miss them when I am back in my country and no longer have access to these treats. I love the rice cookies topped with black sesame, and those that are served with small black balls that looks like deer droppings, but are actually made from rolling together herbs, peanuts and spices, and are very tasty. There is such a variety of delicious foods, tangy, naturally low in fat and very wholesome, sold right on the streets. Some street vendors have gotten to be so popular, that they opened larger operations like Thip Samai, a famous Pad Thai joint that is still in its original location in Bangkok. Away from any of the tourist attractions, this joint is squeezed between motorbike and mechanics shops, and is famous in all of Bangkok for its Pad Thai. Some tourists do come here, but the long line of people waiting in the sidewalk for a free table is composed mostly of locals. Despite the long line that was managed by two traffic policemen, we did not wait very long for our table. It is not a place to linger in conversation with your friends. The menu is small, and they bring the Pad Thai to your table in minutes. With the delicious noodles comes a plate of raw garlic shoots, raw bean sprouts, green limes, and a green leaf that looks a bit like many of the weeds we pull in our garden in NZ. (They taste yummy, and truly add to the dish!). Each of the small tables has on it a tray with jars filled with crushed peanuts, fish sauce, chili vinegar, and sugar, so you can adjust the food to suit your taste. The whole busy operation is conducted right on the sidewalk, with dozens of cooks sautéing the noodles in sizzling woks, and skillfully dropping the whole delicious concoction into a thin, crepe-like egg omelette, folding it over and decorating it with fresh herbs. It was so good we ordered more, and still we cleaned our plates. This most popular Pad Thai cost only 80 Baht, or about $2.75 a plate. Yes, you will also see very unappealing street food, like roasted or deep fried insects and grilled black scorpions on a stick, but those are by now mostly a tourist attraction. The street carts that sell those even ask a small fee from the tourists who wish to take a photo. I saw none of the locals eat those. Bangkok never fails to tantalize the senses. There are lovely daytime markets and busy night markets and every kind of food sold on the streets. There are markets that are rarely mentioned in any guidebook that are lively and wonderful to see. The Thewat and adjacent Thewarat markets were recommended to us by the lady who owns a tiny massage shop across from our hotel. She also did our laundry and later gave us good Thai massages. The Thewet Market is located along the river across the Thewet Ronruemit bridge. Thewet market is filled with fruits, vegetables and exotic greens you rarely see. Almost every plant, seed or bush berry that is not poisonous are used by the locals. There were a dozen varieties of baby eggplants with variegated skins, round or elongated shapes, white, pink and purple colors. There were small bamboo baskets with salted fish, and many plastic pools filled with eels, water snakes, catfish and all sorts of crabs and prawns. The city is filled with Wats, which are Buddhist temples that can take your breath away. They are so ornate and amazing, with their intricate designs and real gold spires, precious stones and emerald or gold Buddha statues. The Grand Palace is one such stunning example of Thai architecture. Even though we had visited it years before, I walked around it slack-jawed, admiring the master craftsmen who created this masterpiece with its many buildings, stupas and halls. The wall murals of this once grand palace for the king provide a shaded walk around the perimeters of the old palace, and are painted with beautiful scenes from Buddhist stories. Each Wat around the city is worth visiting, and many seem to attempt to outdo each other by housing the “Biggest Buddha,” “The Tallest Buddha,” “The biggest reclining Buddha,” “the biggest pure gold Buddha,” in the city, etc. At one very well-known Wat, we could hardly squeeze between the huge groups of Chinese tourists following their loud tour guides who were holding flags. We felt that maybe it was not so smart to keep seeing more of the most popular Wats in the city, and instead decided to visit the Wats that the huge tour groups are not likely to visit on their short and locust-like descents on the city. The Loha Prasat and the surrounding Wat Ratchanadaram are an amazing place to visit with no tourists at all. Loha Prasat stands 36 metres high and is surrounded by 37 spires, representing the 37 virtues believed to be needed to attain enlightenment. Recently renovated, the inside of the wat is beautifully finished and easy to explore. Modelled after a Sri Lankan monastery that now stands in ruins, it is the only structure of its kind in the world. We climbed the winding staircase inside the building and meditated on one of the levels which had openings on all sides, and an image of the Buddha sitting on each end. The breeze made gentle music as it passed through wind-chimes and bells, and the soft chanting music playing from the speakers all added to a most relaxing meditation. I was interrupted by the smiling face of a young monk in saffron colored robes, who was very curious to see foreigners meditating there. In the bigger Wats around the city, which are packed with tourists, we would have hardly been able to find a place to sit, and definitely not to meditate in between the loud tourists. Wat Ratchanadaram is also known for the large amulet market around its entrance. The variety of amulets sold here are believed to offer protection, help in spiritual advancement, help in concentration in meditation, success, abundance, good fortune and health. Many of the designs of the images integrate the Sri Lankan type of Buddhism, which mixes deities from Hinduism, into Buddhism. Amulets which have many sets of eyes are believed to be able to keep you safe from accidents, and those that depict the Buddha covering his eyes will bring you luck. I believe that the statue of the Buddha covering his eyes is meant to symbolize OVERLOOKING people’s faults and imperfections, so you can cultivate a non judgmental mind and therefore experience more inner peace. At this amulet market, we bought statues of three Thai monks, as souvenirs of the fun few days we spent in Bangkok. When the heat of the afternoons got to be too much for us, we made our way to Siam Center and Siam Paragon Mall. There, among many fashionable Thai, we had iced tea in elegant tea houses, ate and snacked on good food, and even did some shopping. We were not the only ones to think of coming to the elegant malls to cool off, as all of the lounging chaises on all the floors were occupied, not by locals with shopping bags, but by locals who had come to cool off, eat and enjoy the free WiFi. On our last day in Bangkok, we visited the Royal Barge Museum. There was a time in Bangkok when the Chao Phraya River, the main river crossing the city from south to north, and its many tributaries, were the most important avenues of transportation. Trade in the city was conducted in floating markets, with boats coming from the nearby countryside to sell their produce. Even the royalty and the Royal Navy used the canals as a main way of transport. At this museum we admired eight of the country’s most unique and stunning vessels. Each of these long and intricately carved, gold painted Royal Barges were carved from the wood of a single teak tree. The Thai royalty used those barges during auspicious ceremonies, like the very rare Royal Barge Procession. The royals have only made an appearance on the water 16 times in the last 65 years. Each of the boats’ prows, or pointed front bows, features mythical creatures that are gilded in gold, and intricately decorated with tiny, shimmering pieces of glass. The barges were rowed by up to 50 specially trained oarsmen, and had additional crew calling orders and navigating, or attending to the royals. From there, we made our way to Wat Rakhang which had some amazing wooden carvings in its old teak buildings, and also had beautiful murals on the walls. Wat Rakhang is known as the “Temple of The Bells,” because it houses some larger bells and many small ones hanging from its eaves and every window. The bells rang melodically as we found a spot on the carpet of the main hall and meditated. When I opened my eyes, the carpet was full of people praying and meditating. This Wat has a very active community life, and even though we visited on a mid-week, non-festival day, it was very busy with a constant flow of locals who had come to pray or to add pieces of gold leaf to the statues of the masters, which is a practice believed to bring abundance and blessings. Near the Wat, I ate a delicious street food lunch, sitting at a communal table that occupied most of the sidewalk. I got a bowl with spicy curry sauce and noodles, and on the table, there were large plates filled with fresh herbs, ferns, bitter gourds, cucumbers, raw baby eggplants, scallion, garlic shoots, pickles, and tree pods, which the attendant peeled for me and sprinkled the seeds on my noodles. You can take as many herbs and pickles as you want and the food was absolutely delicious. It cost one dollar for my wonderful lunch. On our last night, we took the river taxi to Asiatique at Bang Kho Laem. It is a newly built night market on the riverfront, and even though it looks like a mall, the street stalls and shops offer crafts and clothing of a higher quality than you would find in most of the night markets in Bangkok. We ate at a few of the stalls, enjoying a progressive dinner in which we ate one dish from each stall we liked. It is time to say goodbye to Bangkok, and to fly on to Myanmar. We had a fabulous time in this city, enjoyed our daily massages and felt how comfortable life can be here…..
A great meal does not have to cost a fortune…. A freshly squeezed juice should not be a special treat but an inexpensive daily drink, a massage should not cost an arm and a leg, but be so affordable, as to be a part of everyone’s life. 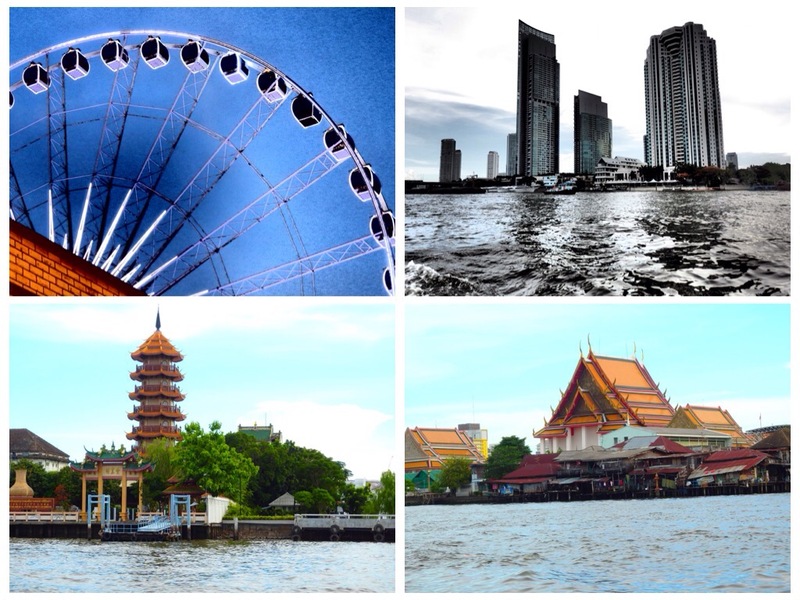 In Bangkok, all of those are affordable and wonderful. The food is very flavorful. Tuk tuk taxis to get around the city are also very affordable. The joys of daily living are easily lost when it gets to be too expensive to enjoy them, as it is in cultures where the price of life’s joys and necessities have become ridiculously high. Kapunka (Thank you) Bangkok, and see you again soon!